BOTHELL, Wash.--(BUSINESS WIRE)--Aug. 17, 2015-- Seattle Genetics, Inc. (Nasdaq: SGEN) announced today that the U.S. Food and Drug Administration (FDA) has approved ADCETRIS (brentuximab vedotin) for the treatment of patients with classical Hodgkin lymphoma (HL) at high risk of relapse or progression as post-autologous hematopoietic stem cell transplantation (auto-HSCT) consolidation. The approval is based on a phase 3 clinical trial called AETHERA that was designed to compare up to 16 cycles (approximately one year) of ADCETRIS therapy administered every three weeks following auto-HSCT to placebo. The primary endpoint was met with a significant improvement in median progression-free survival (PFS) of 42.9 months (95% CI: 30.4, 42.9) for patients who received ADCETRIS versus 24.1 months (95% CI: 11.5, not estimable) for patients who received placebo, an improvement of 18.8 months (hazard ratio=0.57 [95% CI: 0.40, 0.81]; p-value=0.001). In addition, data from the AETHERA trial converted the U.S. accelerated approval of the relapsed classical HL indication to regular approval. ADCETRIS is an antibody-drug conjugate (ADC) directed to CD30, which is expressed in classical HL and systemic anaplastic large cell lymphoma (sALCL), as well as other lymphoma subtypes. This is the third indication for ADCETRIS, which was granted accelerated FDA approval in August 2011 for two other indications: (1) treatment of Hodgkin lymphoma patients who fail autologous transplant or who fail at least two prior multi-agent chemotherapy regimens and are not autologous transplant candidates, and (2) treatment of systemic ALCL patients who fail at least one prior multi-agent chemotherapy regimen. The sALCL indication is approved under accelerated approval based on overall response rate. Continued approval for this indication may be contingent upon verification and description of clinical benefit in confirmatory trials. Globally, there are more than 65,000 cases of HL diagnosed each year. Although frontline combination chemotherapy can result in durable responses, up to 30 percent of these patients fail frontline treatment. The standard for these patients is salvage therapy, followed by auto-HSCT; approximately half of all HL patients who undergo an auto-HSCT experience subsequent disease relapse. The trial achieved its primary endpoint and demonstrated a significant increase in PFS per independent review facility, with a hazard ratio of 0.57 (95% CI: 0.40, 0.81) and a p-value of 0.001. Median PFS was 43 months (95% CI: 30.4, 42.9) for patients who received ADCETRIS versus 24 months (95% CI: 11.5, not estimable) for patients who received placebo. The most common adverse events (≥20 percent), of any grade and regardless of causality, in the ADCETRIS arm were neutropenia (78 percent), peripheral sensory neuropathy (56 percent), thrombocytopenia (41 percent), anemia (27 percent), upper respiratory tract infection (26 percent), fatigue (24 percent), peripheral motor neuropathy (23 percent), nausea (22 percent), cough (21 percent) and diarrhea (20 percent). The most common adverse events (≥20 percent), of any grade and regardless of causality, in the placebo arm were neutropenia (34 percent), upper respiratory tract infection (23 percent) and thrombocytopenia (20 percent). Sixty-seven percent of patients on the ADCETRIS arm experienced peripheral neuropathy. Of those patients, 85 percent had resolution (59 percent) or partial improvement (26 percent) in symptoms at the time of their last evaluation, with a median time to improvement of 23 weeks (range 0.1-138). There are no post-marketing requirements as part of the U.S. approval. The AETHERA data have also been submitted to both the European Medicines Agency (EMA) and Health Canada requesting marketing authorization. As part of a broad clinical development program, ADCETRIS is also being evaluated in three additional phase 3 clinical trials, referred to as ECHELON-1, ECHELON-2 and ALCANZA. Enrollment is expected to be completed in ECHELON-1 and ALCANZA during 2015 and in ECHELON-2 during 2016. ADCETRIS is being evaluated broadly in more than 30 ongoing clinical trials, including three additional phase 3 studies, in earlier lines of its approved classical HL and sALCL indications as well as in many additional types of CD30-positive malignancies, including cutaneous T-cell lymphoma, B-cell lymphomas and mature T-cell lymphomas. ADCETRIS for intravenous injection has received approval from the FDA for three indications: (1) regular approval for the treatment of patients with classical HL after failure of auto-HSCT or after failure of at least two prior multi-agent chemotherapy regimens in patients who are not auto-HSCT candidates, (2) regular approval for the treatment of classical HL patients at high risk of relapse or progression as post-auto-HSCT consolidation, and (3) accelerated approval for the treatment of patients with sALCL after failure of at least one prior multi-agent chemotherapy regimen. The sALCL indication is approved under accelerated approval based on overall response rate. Continued approval for the sALCL indication may be contingent upon verification and description of clinical benefit in confirmatory trials. Health Canada granted ADCETRIS approval with conditions for relapsed or refractory HL and sALCL. ADCETRIS was granted conditional marketing authorization by the European Commission in October 2012 for two indications: (1) for the treatment of adult patients with relapsed or refractory CD30-positive HL following ASCT, or following at least two prior therapies when ASCT or multi-agent chemotherapy is not a treatment option, and (2) the treatment of adult patients with relapsed or refractory sALCL. ADCETRIS has received marketing authorization by regulatory authorities in more than 55 countries. See important safety information below. Progressive multifocal leukoencephalopathy (PML): JC virus infection resulting in PML and death can occur in patients receiving ADCETRIS® (brentuximab vedotin). ADCETRIS is contraindicated with concomitant bleomycin due to pulmonary toxicity (e.g., interstitial infiltration and/or inflammation). Peripheral neuropathy: ADCETRIS treatment causes a peripheral neuropathy that is predominantly sensory. Cases of peripheral motor neuropathy have also been reported. ADCETRIS-induced peripheral neuropathy is cumulative. Monitor patients for symptoms of neuropathy, such as hypoesthesia, hyperesthesia, paresthesia, discomfort, a burning sensation, neuropathic pain or weakness and institute dose modifications accordingly. Anaphylaxis and infusion reactions: Infusion-related reactions, including anaphylaxis, have occurred with ADCETRIS. Monitor patients during infusion. If an infusion-related reaction occurs, interrupt the infusion and institute appropriate medical management. If anaphylaxis occurs, immediately and permanently discontinue the infusion and administer appropriate medical therapy. Hematologic toxicities: Prolonged (≥1 week) severe neutropenia and Grade 3 or 4 thrombocytopenia or anemia can occur with ADCETRIS. Febrile neutropenia has been reported with ADCETRIS. Monitor complete blood counts prior to each dose of ADCETRIS and consider more frequent monitoring for patients with Grade 3 or 4 neutropenia. Monitor patients for fever. If Grade 3 or 4 neutropenia develops, consider dose delays, reductions, discontinuation, or G-CSF prophylaxis with subsequent doses. Serious infections and opportunistic infections: Infections such as pneumonia, bacteremia, and sepsis or septic shock (including fatal outcomes) have been reported in patients treated with ADCETRIS. Closely monitor patients during treatment for the emergence of possible bacterial, fungal or viral infections. Increased toxicity in the presence of severe renal impairment: The frequency of ≥Grade 3 adverse reactions and deaths was greater in patients with severe renal impairment compared to patients with normal renal function. Avoid the use of ADCETRIS in patients with severe renal impairment. Increased toxicity in the presence of moderate or severe hepatic impairment: The frequency of ≥Grade 3 adverse reactions and deaths was greater in patients with moderate or severe hepatic impairment compared to patients with normal hepatic function. Avoid the use of ADCETRIS in patients with moderate or severe hepatic impairment. Hepatotoxicity: Serious cases of hepatotoxicity, including fatal outcomes, have occurred with ADCETRIS. Cases were consistent with hepatocellular injury, including elevations of transaminases and/or bilirubin, and occurred after the first dose of ADCETRIS or rechallenge. Preexisting liver disease, elevated baseline liver enzymes, and concomitant medications may also increase the risk. Monitor liver enzymes and bilirubin. Patients experiencing new, worsening, or recurrent hepatotoxicity may require a delay, change in dose, or discontinuation of ADCETRIS. Progressive multifocal leukoencephalopathy (PML): JC virus infection resulting in PML and death has been reported in ADCETRIS-treated patients. First onset of symptoms occurred at various times from initiation of ADCETRIS therapy, with some cases occurring within 3 months of initial exposure. In addition to ADCETRIS therapy, other possible contributory factors include prior therapies and underlying disease that may cause immunosuppression. Consider the diagnosis of PML in any patient presenting with new-onset signs and symptoms of central nervous system abnormalities. Hold ADCETRIS if PML is suspected and discontinue ADCETRIS if PML is confirmed. Pulmonary Toxicity: Events of noninfectious pulmonary toxicity including pneumonitis, interstitial lung disease, and acute respiratory distress syndrome, some with fatal outcomes, have been reported. Monitor patients for signs and symptoms of pulmonary toxicity, including cough and dyspnea. In the event of new or worsening pulmonary symptoms, hold ADCETRIS dosing during evaluation and until symptomatic improvement. Serious dermatologic reactions: Stevens-Johnson syndrome (SJS) and toxic epidermal necrolysis (TEN), including fatal outcomes, have been reported with ADCETRIS. If SJS or TEN occurs, discontinue ADCETRIS and administer appropriate medical therapy. Embryo-fetal toxicity: Fetal harm can occur. Advise pregnant women of the potential hazard to the fetus. ADCETRIS was studied as monotherapy in 160 patients with relapsed classical HL and sALCL in two uncontrolled single-arm trials. Across both trials, the most common adverse reactions (≥20%), regardless of causality, were neutropenia, peripheral sensory neuropathy, fatigue, nausea, anemia, upper respiratory tract infection, diarrhea, pyrexia, rash, thrombocytopenia, cough and vomiting. ADCETRIS was studied in 329 patients with classical HL at high risk of relapse or progression post-auto-HSCT in a placebo-controlled randomized trial. The most common adverse reactions (≥20%) in the ADCETRIS-treatment arm (167 patients), regardless of causality, were neutropenia, peripheral sensory neuropathy, thrombocytopenia, anemia, upper respiratory tract infection, fatigue, peripheral motor neuropathy, nausea, cough, and diarrhea. MMAE exposure and adverse reactions are increased in patients with moderate or severe hepatic impairment or severe renal impairment. Avoid use. For additional Important Safety Information, including Boxed WARNING, please see the full Prescribing Information for ADCETRIS at http://www.seattlegenetics.com/pdf/adcetris_USPI.pdf. Lymphoma is a general term for a group of cancers that originate in the lymphatic system and is the most common type of blood cancer. There are two major categories of lymphoma: HL and non-Hodgkin lymphoma. Classical HL is distinguished from other lymphomas by the characteristic presence of CD30-positive Reed-Sternberg cells. The Reed-Sternberg cell generally expresses CD30. According to the American Cancer Society, approximately 9,050 cases of HL will be diagnosed in the United States during 2015 and more than 1,150 will die from the disease. Seattle Genetics is a biotechnology company focused on the development and commercialization of innovative antibody-based therapies for the treatment of cancer. Seattle Genetics is leading the field in developing antibody-drug conjugates (ADCs), a technology designed to harness the targeting ability of antibodies to deliver cell-killing agents directly to cancer cells. 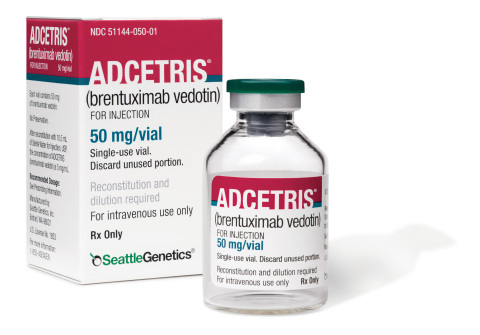 The company’s lead product, ADCETRIS® (brentuximab vedotin) is a CD30-targeted ADC that, in collaboration with Takeda Pharmaceutical Company Limited, is commercially available in more than 55 countries, including the U.S., Canada, Japan and members of the European Union. Additionally, ADCETRIS is being evaluated broadly in more than 30 ongoing clinical trials in CD30-expressing malignancies. Seattle Genetics is also advancing a robust pipeline of clinical-stage programs, including SGN-CD19A, SGN-CD33A, SGN-LIV1A, SGN-CD70A, ASG-22ME, ASG-15ME and SEA-CD40. Seattle Genetics has collaborations for its ADC technology with a number of leading biotechnology and pharmaceutical companies, including AbbVie, Agensys (an affiliate of Astellas), Bayer, Genentech, GlaxoSmithKline and Pfizer. More information can be found at www.seattlegenetics.com. Certain of the statements made in this press release are forward looking, such as those, among others, relating to the therapeutic and commercial potential of ADCETRIS, the anticipated benefits of Seattle Genetics’ ADCETRIS clinical development program and expected enrollment completion in Seattle Genetics’ ADCETRIS phase 3 clinical trials. Actual results or developments may differ materially from those projected or implied in these forward-looking statements. Factors that may cause such a difference include risk of adverse events associated with ADCETRIS use, negative or unexpected ADCETRIS clinical trial results and adverse regulatory actions affecting ADCETRIS, all of which could result in Seattle Genetics being unable to broaden the use of ADCETRIS. Seattle Genetics may also experience delays in the enrollment in and conduct of its clinical trials, and obtaining data from its clinical trials, in each case for a variety of reasons, including the difficulty and uncertainty of pharmaceutical product development. More information about the risks and uncertainties faced by Seattle Genetics is contained in the company’s Quarterly Report on Form 10-Q for the quarter ended June 30, 2015 filed with the Securities and Exchange Commission. Seattle Genetics disclaims any intention or obligation to update or revise any forward-looking statements, whether as a result of new information, future events or otherwise.